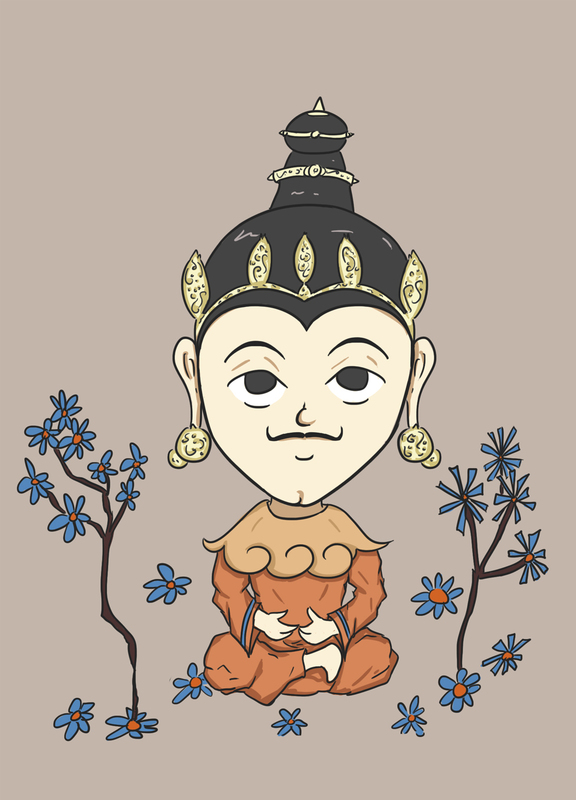 Campaka was a wealthy Tibetan king consumed with the joys of his beautiful gardens. When a begging Yogin was not impressed, the king became curious about what was beyond the pleasures of his life and gardens. The guru instructed him to meditate upon “the flower of reality” to uncover truth. Campaka did this for many years and achieved his goal. Having attained Enlightenment, he taught his courtiers and subjects for the rest of his life. Detachment and determination are obvious themes in this story. Perhaps more subtle lessons are that any path can lead to truth and how each person has their own path. Campaka’s attachments did not go away when he started his search. He did not renounce his kingdom or his place in it. Instead he used the flowers he loved as tools in his search. Once he found truth, being king allowed him to share the way with others. Campaka’s example encourages each person to find and walk their own path. People may search for truth in their job, their family, a religion, or in removing themselves from the world. Where one person contemplates the scent and beauty of a flower, another comes through war or disease seeing the truth behind all things. A guru may helpfully point the way, but when searching there is no “wrong” way and there are no rules. We can each awaken to truth by following our path rather than seeking to copy another.